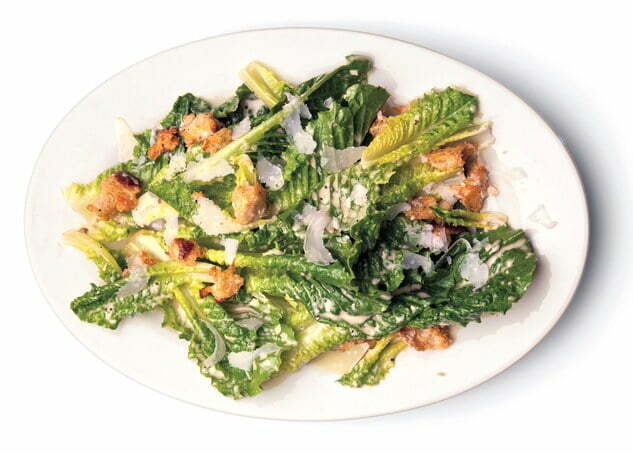 Ceasar Salad is undoubtedly the most popular of all the salads. Hence, the name fits for royalty. It has gained popular acceptance mainly because it has the taste and texture you can actually enjoy. In other words, it does not taste like most healthy food should. Listed below are two amazing recipes and takes on the well-loved salad. Cut a loaf of stale bread into 1/4-inch cubes. Season with melted butter, thyme, basil, garlic, oregano, salt, and pepper. Bake until crisp. In a large bowl, grind anchovies to a paste-like consistency. Stir in all remaining ingredients except Romaine lettuce. Tear Romaine lettuce into large pieces and place in large bowl. Pour salad dressing over lettuce and toss salad. Serve immediately. 1.For the dressing, combine the mayonnaise, Parmesan, lemon juice, mustard, Worcestershire sauce, garlic, anchovy, and pepper in a small bowl. Whisk until well incorporated. Whisk in the water to desired consistency. Refrigerate until chilled. 2.Preheat a grill to medium-high or the oven to 450 degree F. Add the shrimp with 2 teaspoons of the olive oil in a bowl. In a separate bowl, gently toss the scallops with the remaining 2 teaspoons oil. Season the shrimp and scallops, on both sides, with kosher salt and pepper. Thread 4 shrimp onto each of 4 lemongrass skewers, threading them through the head and tail so they will lie flat when cooking. Thread 4 scallops onto each of the remaining 4 lemongrass skewers, so they will also lie flat when cooking. Cover the grill and cook for 8 minutes, rotating the skewers frequently, until the shrimp are pink and the scallops are opaque throughout. Or, place the skewers on a baking sheet lined with aluminum foil and bake for 8 to 10 minutes on the top rack of the oven. 3.Toss the croutons in a bowl with about 1/4-cup of the dressing. Add the greens and lettuce and Parmesan cheese. Add about 1/2-cup dressing. Season with more kosher salt and pepper to taste, if necessary. Divide among 4 serving plates. Crisscross 2 seafood skewers on top of each salad portion. 4.The dressing can be made up to 1-week in advance and refrigerated. The seafood can be grilled or baked up to 8 hours in advance and refrigerated. (If precooked, be sure to cook the seafood on the rare side so as not to overcook it when reheated.) Reheat in a preheated 350-degree F oven, covered with aluminum foil, for about 5 minutes.